Table code is written by copying. Inserting records into table cells. <th></th> – default font bold. The following table attributes are used to create the design. 1. width – table width. 2. frame – creates borders around the table. 3. align – alignment of the table on the page. 4. border – creates a frame of the table and cells. 5. bordercolor – frame color. 6. bgcolor – table background color. 7. background – background image in the table. 8. cellpadding – the distance between the frame and the contents of the cell. 9. cellspacing – cell spacing. 10. rules – overrides the cellspacing attribute. 12. cols – indicates the number of columns, which speeds up the loading of the table. 13. colspan – merges cells horizontally. 14. rowspan – merges cells vertically. 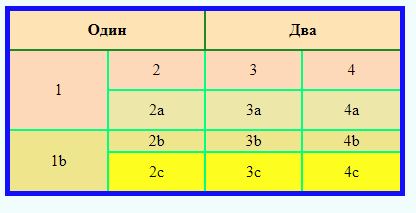 Many of the attributes of the tables are outdated, so we will do the design in css. Styles for tables can be entered both in the style.css file, and directly in the <table> tag, and other table tags. 1. The width and height of the table – can be specified in all sizes available in the web units. The height of the table is usually not specified, as determined by the number of rows, but in some cases, it is possible to use it. 2. Borders and frames of the table. Now make a border for each cell. So the browser displays the default table. Direct inclusion, at first glance looks very cumbersome and difficult to perform. In fact, it is not. Only the first lines and some styles are written manually, everything else is copied. With direct inclusion, each row, column, cell can set its own background, font and frame color. a) Alignment and indents on the page. 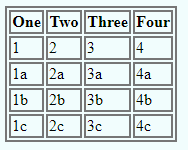 To align the table along the edges of the page, the float property is entered in the table tag, which takes the values left or right. In this case, the table is positioned on the left or right edge of the page, and the text below the table flows around it on the right or left respectively. If the text is enclosed in a block tag, then it needs to set the property display: inline;, otherwise float:left; may not work. In order to set the external indents, use the margin property. Where the first digit is indent on the top. The second digit is the indent on the right. The third digit is indent from on the bottom. The fourth digit is indent from on the left. When using the value auto, only three values are indicated. b) Alignment and indents within the table. The contents of the top row of the table, tag th, browsers default display in bold and aligned in the center of the cell. To align the contents of all the cells in a table, use the property text-align to which you can set the values left, center, right. Since browsers align text to the left by default, center is mainly used. By default, the browser chooses the size of the cells by the size of the content with a small indentation. The padding property is entered in the th, td tags. 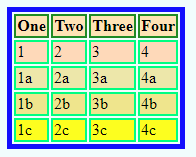 If you need to make rows of different heights, then the padding property is entered by direct inclusion. 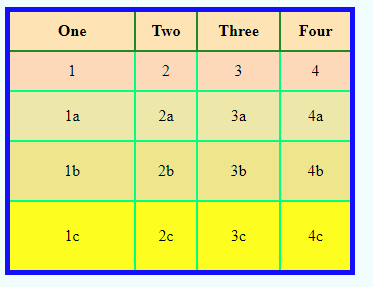 In this case, it is enough to set the required indent to only one cell, and the rest will align with it. It is necessary to take into account that, taking into account the indentation, the cell sizes are regulated by default by the size of the content, and all cells and columns take the size of the largest. Merging cells is performed using attributes only. Cell connection attributes apply to th, td tags. 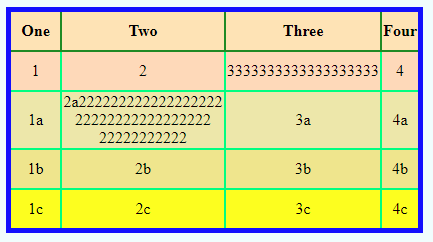 To merge cells horizontally, the colspan attribute is used, the value of which indicates the number of cells to be merged. When merging cells, extra cells will appear that need to be removed from the code. To merge cells vertically, the rowspan attribute is used, the value of which indicates the number of cells to be merged. 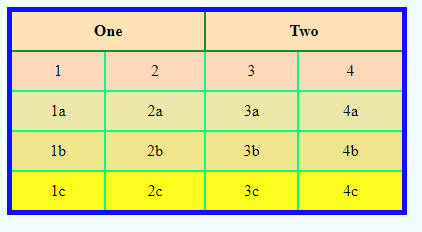 The number and location of the merged cells of the table, is constructed depending on the task. 6. Background Images and Pictures to Table. The background image is inserted into the table using the style property background-image. The background image can be installed separately in any cell of the table. You can insert a picture that is not a background image into any cell of the table. The picture is inserted as the contents of the cell, between the <td></td> tags. 1. The <td> tag The style property position: relative is entered. If desired, you can insert both a background image and a picture on top of it. Scripts are inserted into the table along with the contents of the cell, or instead of it. The script is positioned as a picture. For example, let’s insert the current date and time script into the table. The script itself can be found here, and set outside the table, anywhere on the page, better at the end, and only html, css and the startup script are installed in the table. Feedback forms are added to the table well as scripts and images.